Adjust oven rack to middle position and heat to 375 degrees. 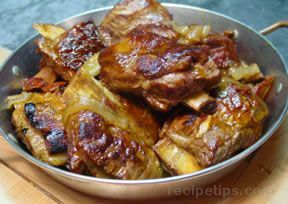 Season ribs with salt and pepper and arrange bone-side up in roasting pan. 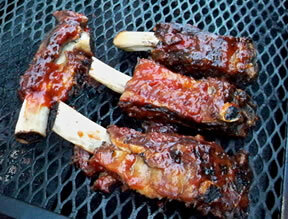 Cover tightly with aluminum foil and roast until fat has rendered and ribs are browned, 1 1/2 to 2 hours. Transfer ribs to paper towel-lined plate. Reserve 2 T. rendered beef fat and discard remaining drippings. Reduce oven temperature to 300 degrees. Heat reserved fat in large Dutch oven over medium-high heat until shimmering. Cook onion, carrot, and celery until lightly browned, about 5 minutes. Add garlic and tomato paste and cook until fragrant, about 1 minute. Add broth, port, vinegar, tapioca, rosemary, and ribs to pot and bring to simmer. Cover pot and transfer to oven. 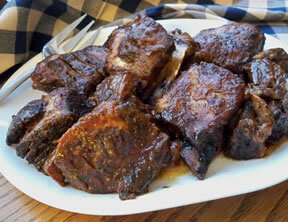 Cook until sauce is slightly thickened and ribs are completely tender, about 2 hours. Transfer ribs to serving platter. Strain and skim sauce. Serve, passing sauce at table.